We searched through the website, my personal notes, and the Facebook page, and then gathered all of the Shell Game relevent entries into ONE place to make it easy to SEE how this all happened. It's been an eighteen month journey through a four album landscape. Hopefully I let you in on some of the picture about how songs are conceived. CLICK HERE to go back to the beginning - Jan. 04, 2013. 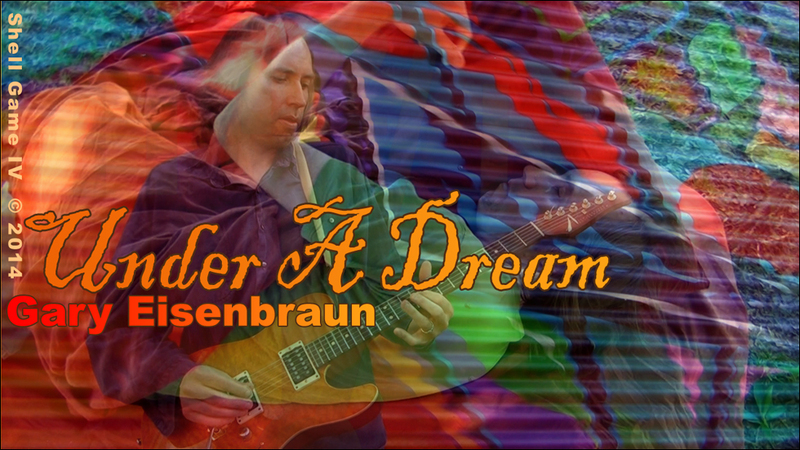 FINAL SHELL GAME UPDATE >> WEBSITE (03/16/15): The final of TEN Shell Game music videos... "Under A Dream" is a first for me, in that it's an actual official music video for one of my rock guitar instrumental songs. This one was definitely a new kind of challenge. It's much easier to build a story of a song with words. Thankfully, "Under A Dream" beckoned a surrealistic approach. We wanted to capture a dream state, so I found myself sleeping around town quite a bit (during the filming)... and I lived to tell about it. There were a couple of really strange sleeping locations that were left on the cutting floor, so to speak, because we just ran out of space in the video. It also features select (unused) clips from previous Shell Game videos as we wanted to tie up the entire series with this one video. This is it. I played my last hand of the Shell Game. 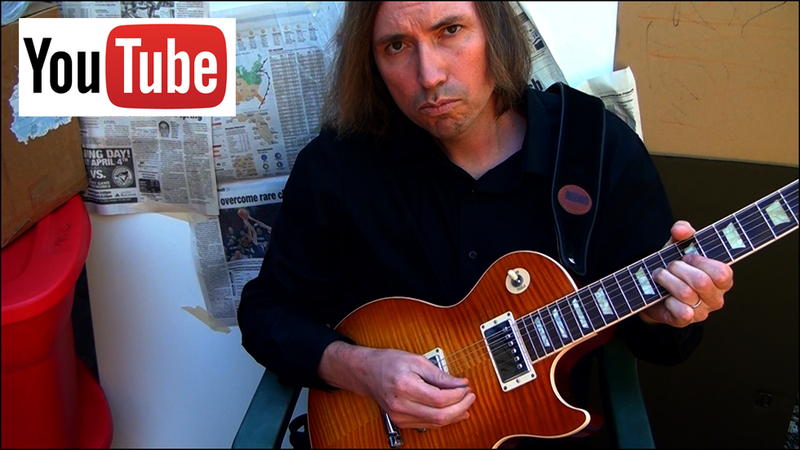 Check out this, my rock guitar instrumental video on my YouTube Channel. 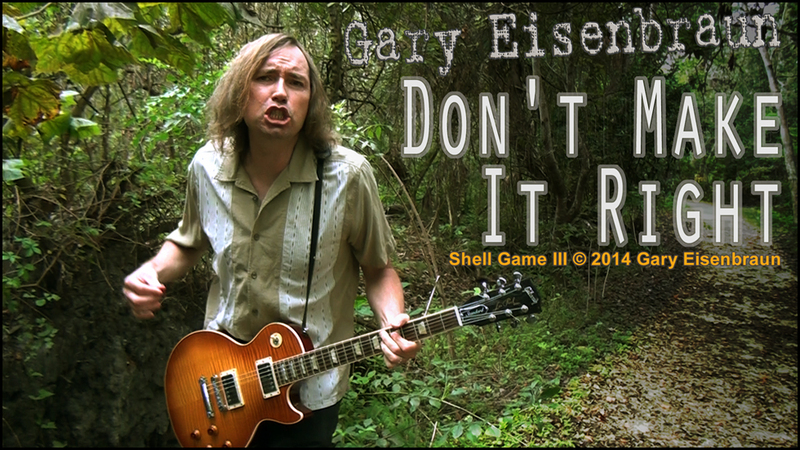 WEBSITE (01/21/15): A bit swampy... Ahhhhh, the first new music video of the new year.... "Don't Make It Right" from Shell Game III has, kind of a laid back swampy groove to it. And..., luckily for us (being in Florida)... we can match the groove with actual swampitude. AND..., I'm locked in a high stakes poker game... will I win? That's the question... and... what does winning mean? Another question. Ha. Only the joker knows. Check out the new video on my YouTube Channel. FACEBOOK (01/21/15):We just uploaded the new music video for the song "Don't Make It Right" . If I were to use one word to describe it, it would be swampy. Enjoy. FACEBOOK (01/14/15):Well, we have a couple of more music video's coming soon, from "Shell Game III". The first of which is for the song "Don't Make It Right". This one has a real swampy feel to it juxtaposed with some different imagery. AND... I learned that you can't build a house of cards in a twelve mile an hour wind. Perhaps... a life lesson? Ha. Anyway. 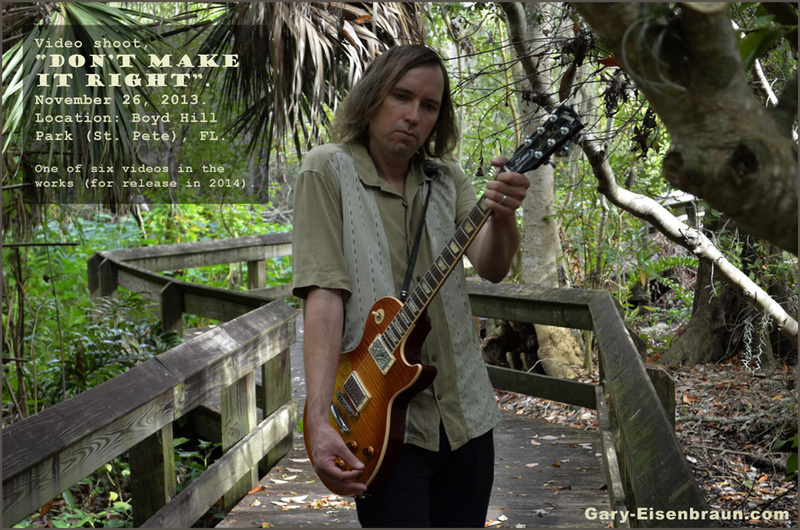 "Don't Make It Right" is getting the final tweaks as we speaks. WEBSITE (11/15/14): A Man With A Vision? 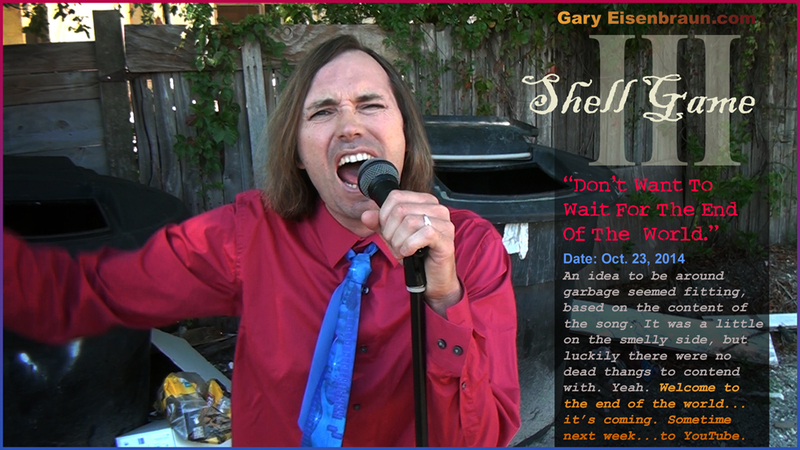 The strange, I mean "interesting" character pictured above... is the Star of the first music video from Shell Game III. Delusions Of Grandeur...? Possibly. He's definitely lost in his own little world. AND, he carries it around with him most everywhere. Either way, he's got charm. As for the song, it's a funky, gritty, goodtime song that doesn't take itself tooooo seriously. 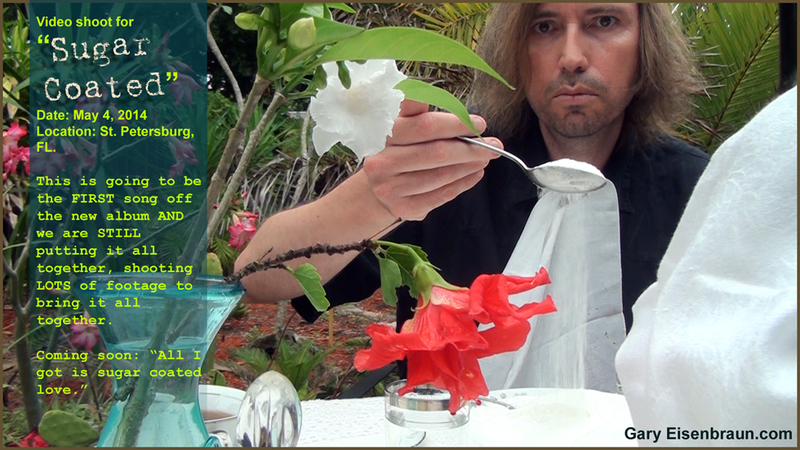 We shot parts of this video on the Salvador Dali museum grounds. The perfect setting. Ahhh, the melting clocks. We also shot parts of it in the Boyd Hill Nature Preserve in the middle of a prescribed burn of the foliage. The contrast between the three settings just fit. Did I say three? 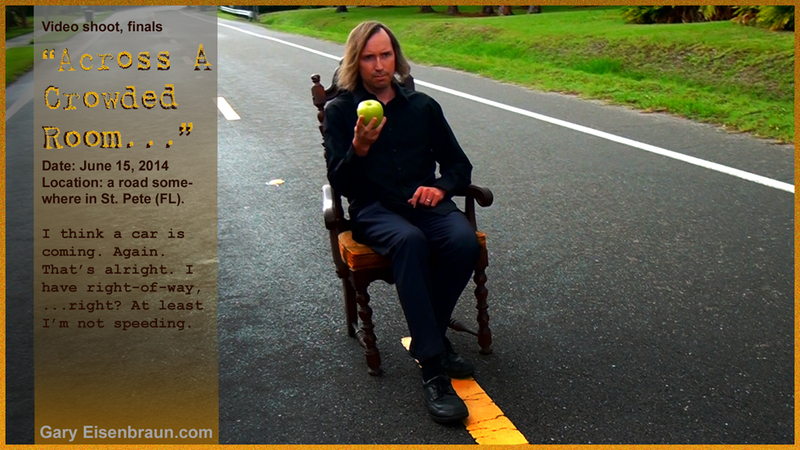 Check out the new video: "Don't Want To Wait For The End Of The World." FACEBOOK (11/15/14):Alright, the zany music video for "Don't Want To Wait For The End Of The World" has been posted to YouTube. This was a particularly fun one to put together, with much laughter had by all. The main character in the video is quite the happy-go-lucky sort and seemed to take on a life of his own. Some of the real funny stuff at the end was a last minute addition AND actually shot at the last minute too. I hope you enjoy! Here's the link to video. FACEBOOK (11/05/14):Had fun shooting footage for "Don't Want To Wait For The End Of The World". We used the guise of Halloween to move about the city without people taking too much notice (there were enough strange people already walking around on Halloween). Had particular fun outside The Salvador Dali Museum in St. Petersburg. Dignity often takes a back seat on these shoots... and this leads to much laughter. This character in the photo seemed right at home at the Dali. We have a bit of a technical problem that is delaying completion, but the video should be done in the next week. FACEBOOK (10/23/14):Today I was shooting footage for my NEXT music video, "Don't Want To Wait For The End Of The World." I was hanging out by the garbage (some would say that is where my music belongs). Ha. Still some more footage to be shot (in the next few days). Have a few crazy ideas up our sleeve. Coming soon to youtube. Stay tuned. FACEBOOK (10/15/14):Well...it's official. Shell Game III and IV are now available. These two albums are fused into ONE, with Shell Game III being the third album full of vocal, bluesy rock songs. The Shell Game IV (songs #12-23) are actually guitar instrumental songs. This concludes the series that began 7/7/14... but not the music videos! We have three more coming and one of those will be a guitar instrumental track made visual. But the FIRST one (coming in a few weeks) will be for the song, "Don't Want To Wait For The End Of The World". I ordered a world on amazon and it was just delivered. The power of the internet. Wow. 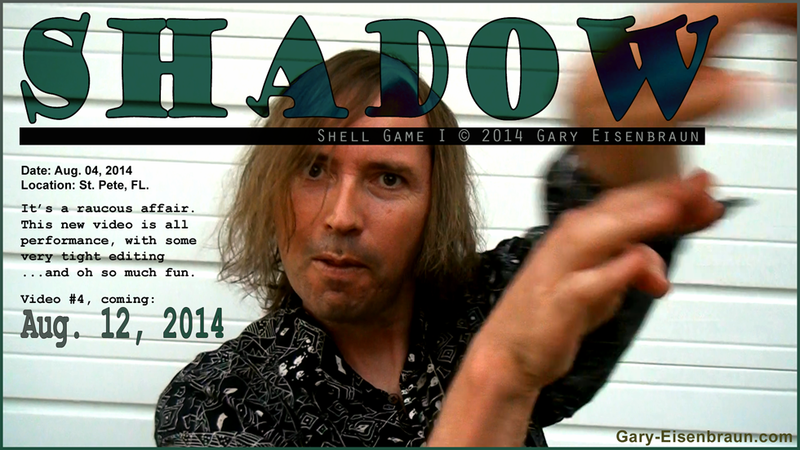 WEBSITE (10/14/14): Shell Game III & IV.Now available, the grand finale in the Shell Game Saga. Shell Game III has 11 new blues rocking vocal tunes but it doesn't end there. 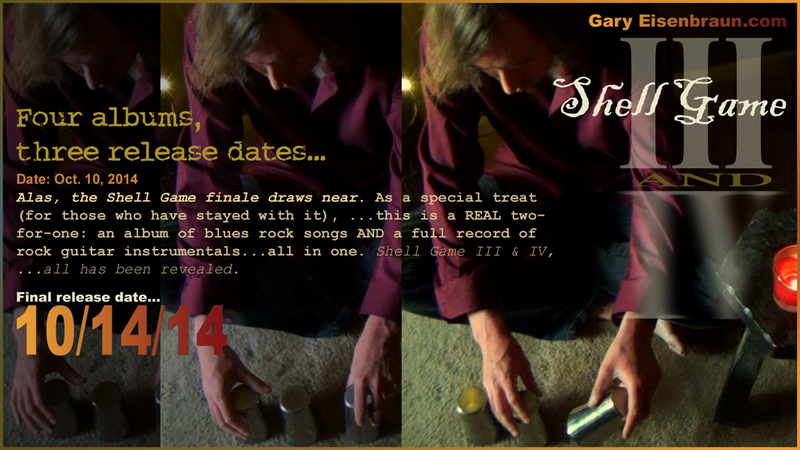 This is Shell Game III AND IV as promised (four albums, three release dates). You get a double album for the price of one BECAUSE the joker in the deck (the guitar rock instrumental) is hidden inside of Shell Game III.... check out songs #12 - 23. Ha. I had a LOT of material that I didn't want to give up on and these Shell Game releases allowed me that freedom. I don't know if I will ever release this much music at once again because it is a LOT to keep track of. It got crazy there for a bit. But I'm much better now. BTW: full streams of all FOUR Shell Game albums are up on my YouTube Channel. Enjoy. FACEBOOK (10/10/14):I've been plowing through Pete Townshend's autobiography, "Who I Am", the last couple of days. I'm a lifelong fan of The Who, so I found it a fascinating and insightful read. As a guitarist, Pete rarely gets the credit he deserves for his very individualistic style and top notch rhythm playing. As for his songwriting, he's at the top of the heap. Now to my news: the final installment of the Shell Game series is available for pre-order. This is essentially two albums in one: a rock vocal album and an album of guitar instrumentals. The first song "Don't Want To Wait For The End Of The World" is also ready for download NOW on iTunes! Yeah..
WEBSITE (10/07/14): The latest video. Up. Now. 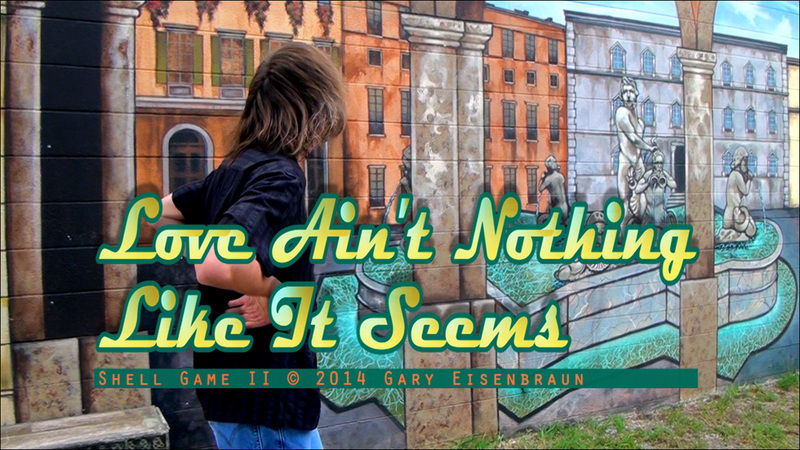 Enjoy.The second of the two Shell Game II music videos, "Love Ain't Nothing LIke It Seems," has some interesting characters starring in the lead roles. Some rather promiscuous primitive chess pieces might be entangled in a web of deceit. Maybe. I'm not saying. You decide. Now, onto the important stuff... the song itself is BOTH laid back AND rocking... with a definite blues rock feel. You know. That's how I like it. Anyway. Enjoy the video. Click. Subscribe. Whatever. FACEBOOK (10/05/14):Moments ago, we uploaded the new music video for "Love Ain't Nothing Like It Seems". I am particularly proud of this one for all of the symbolic images... for example the promiscuous chess people. They need to keep on their squares! Ha. Plus... it's one of my favorite songs from Shell Game II. Anyway. Enjoy the video . FACEBOOK (09/24/14):Upcoming, in the next few weeks... both a new music video (which we are going to be working on THIS week) ....AND the final release in the Shell Game series! Woohoo. AND..., there's MORE stuff in the pipeline. 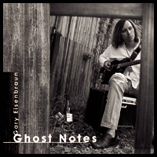 Right now, I am putting the finishing touches on a "Ghost Notes" deluxe release for December (2014). I am VERY excited by how much the album has been upgraded (both sonically AND by almost doubling the number of songs included in the package). AND..., just by tweaking the song order... I think something kinda magical happened. Yeah magic. But, as of TODAY, finalizing means that I am tweaking a few more mixes and then she'll be ready to go. There's even MORE stuff beyond that... but why confuse the issue further???? 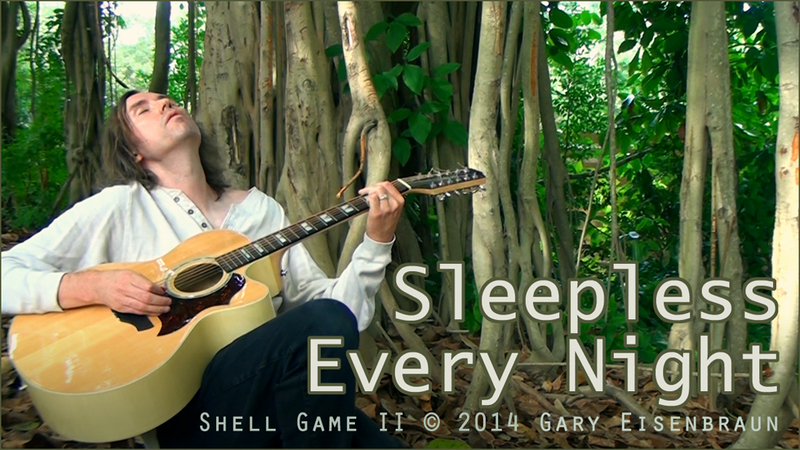 GARY'S NOTES (09/03/14):This is the first official music video from Shell Game II, "Sleepless Every Night" - a soulful acoustic song with electric guitar flavors. I feel like this video does a pretty good job at capturing the soul within the song. The beautiful backdrop with the banyan trees and the wind whistling through... very southern. I remember the day we filmed the main footage for the video.... the whole moment... was even bigger there than even can be captured on film. This was a special place, this Indian Mound. Like the song itself, I resisted the temptation of overdoing the video. Consequently, this one is very special to me. Enjoy. FACEBOOK (09/04/14):We just finished, and uploaded, the first music video from "Shell Game II" ...for the song "Sleepless Every Night". This one is a bit more acoustic in flavor and came out pretty cool. Most of the outdoor part was shot at an ancient Indian Mound in St. Petersburg. It was real cool, ...and humbling, to be amongst the mighty Banyan trees. Ironically, the night I uploaded the video was indeed a sleepless night due to a rat that found its way into my attic. No need to worry though, the rat has met his match in me. And, YES, I will get some sleep. Anyway, check out the video: http://youtu.be/kSYy3orWqps. 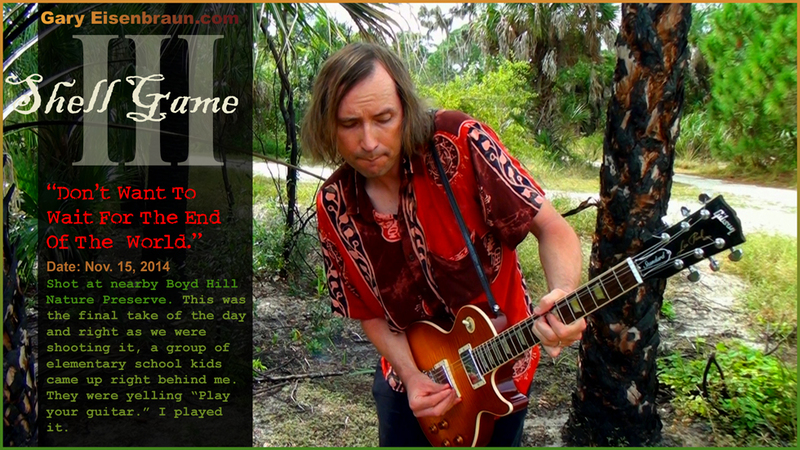 WEBSITE (08/26/14): Shell Game II: second of three.... Shell Game II is available for perusal TODAY. Perhaps you could call this the middle child... or at least, twelve new songs in the series. You can check out the YouTube full album stream that was uploaded late last night, and Yes! it's available in digital form at most of the popular retailers. We are also working on a brand new music video, "Sleepless Every Night." Which should be coming out in the next few weeks (or even earlier). FACEBOOK (08/26/14):Yeah! Shell Game II, the second of three releases, is new to the world today. It's available on iTunes, Amazon etc. ...AND as a free stream on YouTube. While we were celebrating the release, I listened to the album for the first time in quite a while... and there is a lot of it that I'm proud of. Plus, it has a slightly different feel from Shell Game I, ...which was a goal of mine (for each of the three to have singular identities). Anyway. Enjoy, etc. Here's the link to the full album stream. 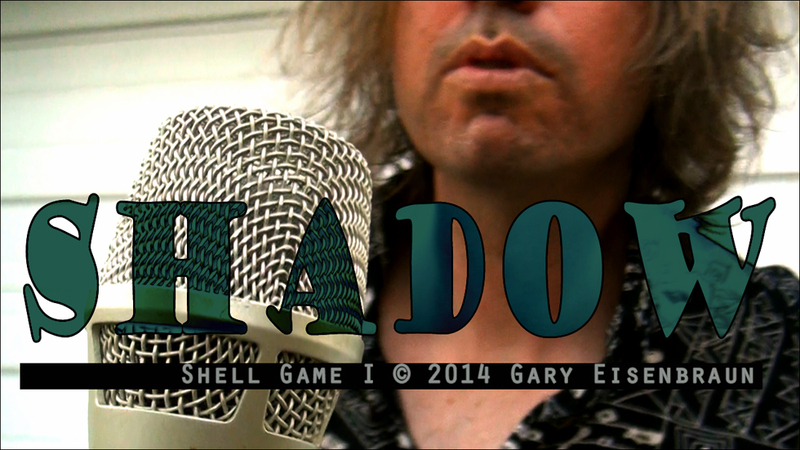 WEBSITE (08/19/14): Shell Game II: pre-order now. There was so much Shell Game content to go around that I broke it into pieces (four to be exact). I tried to give each CD a different flavor because I wanted each album to stand up on its own. Judge for yourself, ...was I successful? Anyway. Shell Game II is available for pre-order on iTunes, Amazon.com and you can even get the third track from Shell Game II, "Sleepless Every Night" NOW through iTunes. There are two videos coming to support the release. The music videos will be for the songs: "Sleepless Every Night" and "Love Ain't Nothing Like It Seems". Stay tuned. More details coming later. FACEBOOK (08/18/14):I spent the last 9 days writing new songs. Having no particular expectations except wanting to do something different, ...I proceeded. About the only music I leaned on for inspiration was The Rolling Stones and early Who music. 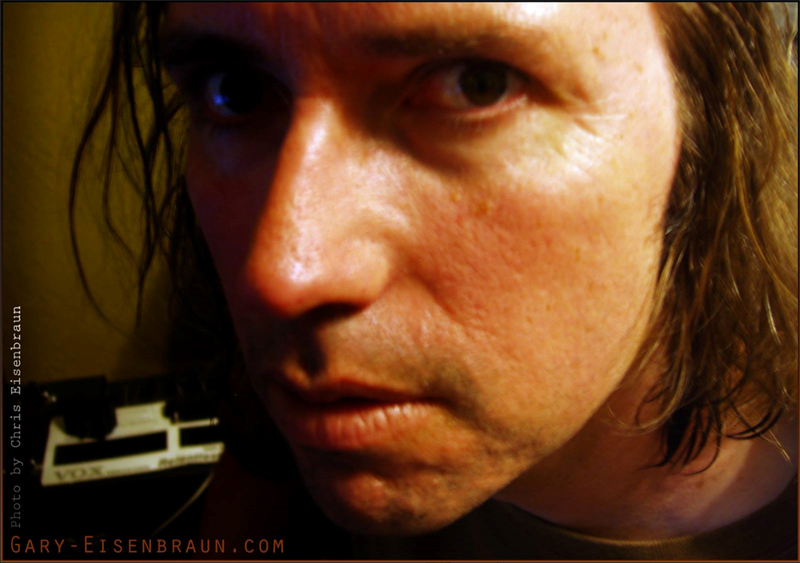 Well, in those 9 days, 14 new songs (that are as inspired as anything I have ever done) began to take shape. What was particularly inspiring was the lyrics. They came from a part of me that I have never mined before. I feel like a light got turned on. Anyway. These songs aren't completed. They are very promising sketches. You'll hear more about THIS later. 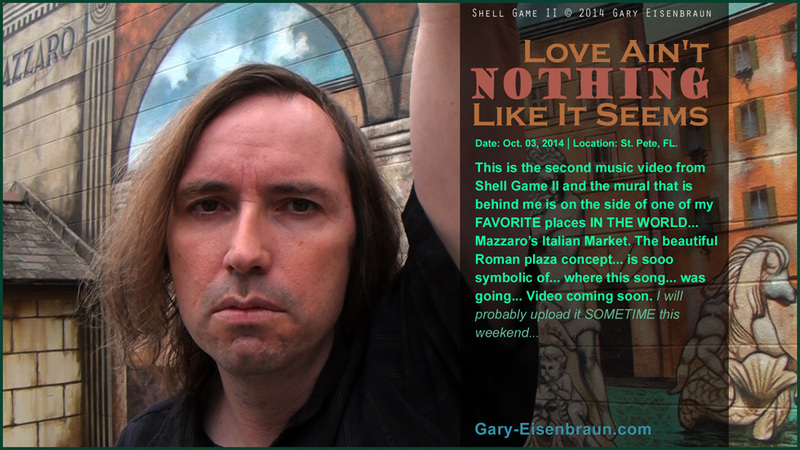 For now.... a week from tomorrow is the release of SHELL GAME II (the second of three). The first song, "Sleepless Every Night" is available on iTunes. The album is available for pre-order on iTunes and Amazon.com. FACEBOOK (08/09/14):Just posted the latest video. Like everything in life, it's a learning experience. We uploaded this video a different way and I think it looks SHARPER. That goes with the music, this song has more attitude! Check it out: http://youtu.be/3X5a7t8eEAc. 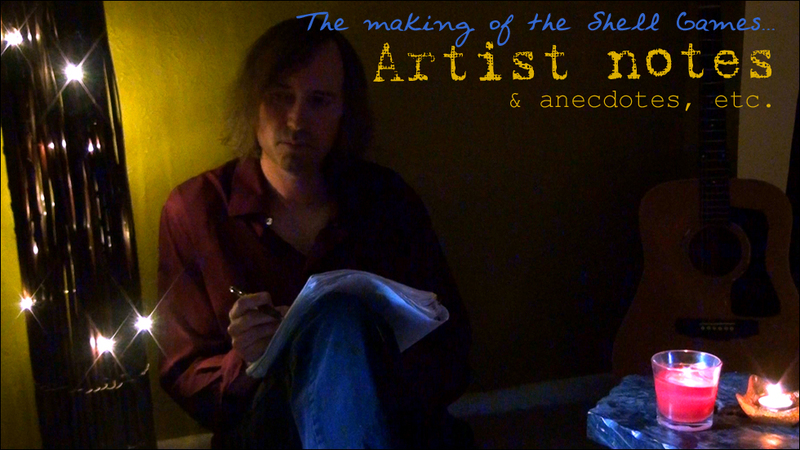 FACEBOOK (08/04/14):Just putting the finishing touches on "Shadow", the FOURTH music video from Shell Game I. The video is a lot of fun. Strictly performance with some very quick editing. We found a cool New Orleans sort of vibed place in a part of Ybor City (Tampa) as one of the locations. To be uploaded: early next week. Goto: DIRECT to the video, "Who's More Afraid?". 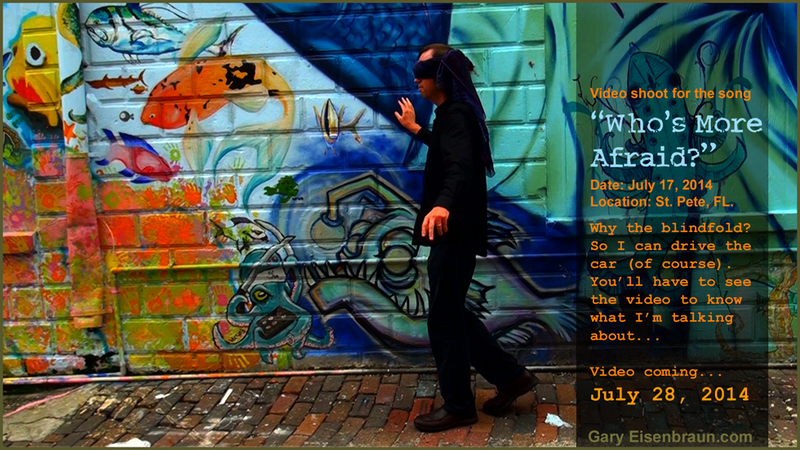 GARY'S NOTES (07/23/14):The making of the soon-to-be-released music video for "Who's More Afraid? ", ...was just like the song itself: quite smooth in coming together. I think back to when I wrote this song and how it quickly became one of my favorite songs that I've ever written. The groove of the song harkens back to a 70s R&B vibe ...but with my usual guitar mayhem included. Every track I laid down was in one or two takes and the song was written AND recorded in just a couple of days. When we finally got around to doing the video, the same effortless-ness happened. When something is that easy, then you know you're onto something good. 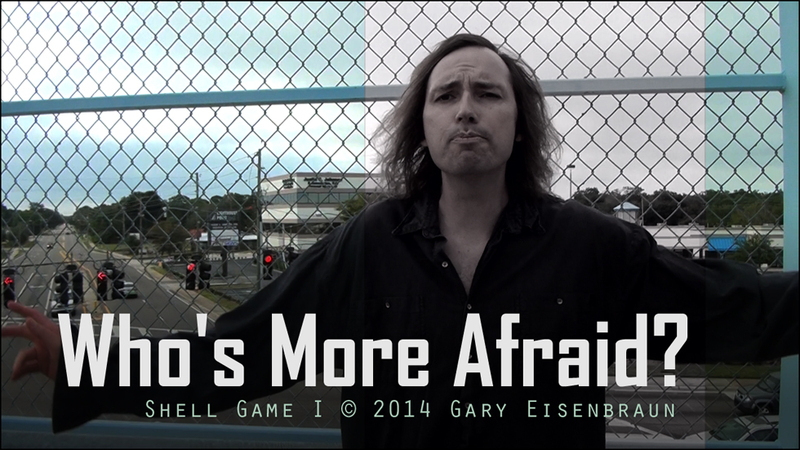 FACEBOOK (07/21/14):We're finalizing the THIRD music video from Shell Game I - for the track, "Who's More Afraid?" This one came together quite nicely, showcasing me blindfolded. Blindfolded. In many endeavors. I found out that it's probably not a good idea to try and drive a car blindfolded. Luckily I didn't hit anything. Yeah. Anyway. We will be uploading it next Monday. Ok? FACEBOOK (07/07/14): Alas. I have, for you, a spanking new album and a similarly spanking new music video AND the entire album... streaming on YouTube. You likey? I am exceedingly proud of this album (Shell Game I) and have been eagerly anticipating the release date. Today. The announcement email posted below, has links to EVERYTHING including the new video, "Across A Crowded Room" which was a quite a travail to complete. It's done. It's uploaded. Yeah. Now, to celebrate I am about to open a 2010 Torbreck Struie. Enjoy. 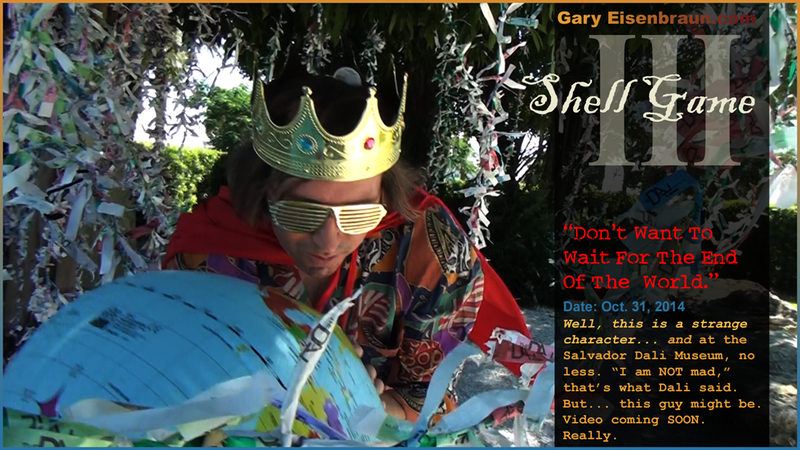 Official release announcement email: http://www.gary-eisenbraun.com/emails/2014-SG01/GE_Shell-Game-Trilogy_01.html. WEBSITE (07/07/14): Shell Game I, official release. Finally. The first of three official album releases. Here. Now. Eighteen months in the making, the first eleven songs are here. Sweat, blood, tears and a little red wine (for medicinal uses of course)...out of this came Shell Game I. I'm very pleased with the outcome. Goto: CD website for The Shell Game Trilogy. BTW: here's a link to the official release announcement email. FACEBOOK (07/01/14): Six days to go until Shell Game I arrives (7/7/14). A lot of hard work has gone into creating something of passion. A little more needs to be done before the wine can be uncorked... rest assured that I have saved a good one for the occasion. But until then, here's a sneak preview of the album artwork. WEBSITE (06/23/14): And, so it begins... FINALLY. The first of FOUR albums (three release dates) comes out 7/7/14... but right now, there's an advance track floating around on iTunes and YouTube. This song is called, "Sugarcoated" and it's a song close to my heart in the blues heavy sort of riff rock tradition. Check out the music video (that we JUST uploaded to YouTube)... I'll tell you a secret. At the very end, in the alley, ....you'll see me pause and look to my left. That's because, at the VERY moment the song ended... somewhere in Ybor City (Tampa)... a rooster crowed. I was in the city but I was out in the sticks. Hunh. How blue can you get? FACEBOOK (06/23/14):I've been talking about it a long time. Finally, the first step is taken. 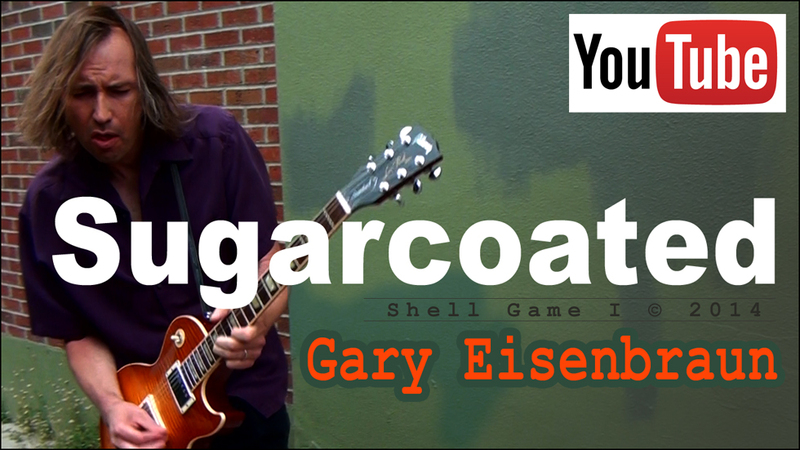 I JUST uploaded, "Sugar Coated", my new music video from the new album Shell Game 1. 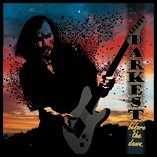 This song is in the heavy blues riff rock tradition that is so near and dear to me. You can get the song NOW from iTunes, or pre-order the album from many online digital retailers. You've seen the pictures of the makings of a lot of these videos (below) and NOW it makes me happy to FINALLY share one with you. Without further ado, here's the new video: http://youtu.be/tW0gtfOBR-g.
FACEBOOK (06/15/14): We are just about done editing the second music video for the upcoming "Shell Game" extravaganza. 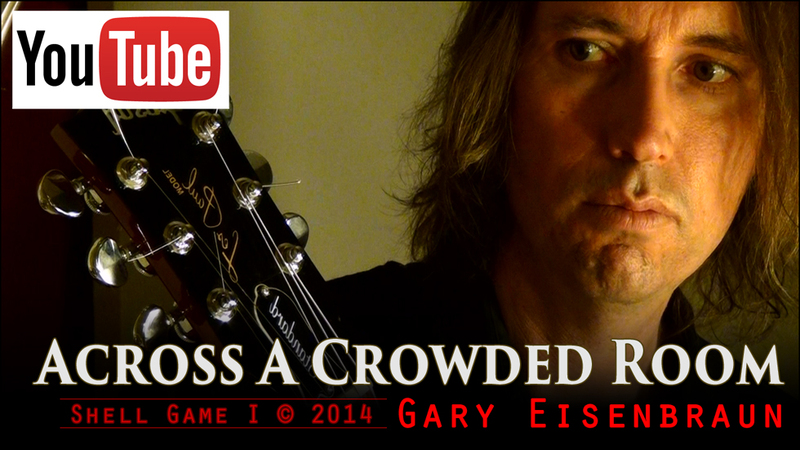 "Across A Crowded Room" is a song that I am real proud of. It's kind of an epic piece and required some thought to bring into video form. So why not start playing in traffic? Somebody had a GREAT idea to put me in the middle of the road in the middle of the day dodging cars. I survived. Had a few close calls with cars coming around the corner, but... the video is coming out quite well. It's in post production right now, almost done. BTW, the FIRST video, "Sugar Coated" will be posted on YouTube early next week. WEBSITE (06/03/14): It's official, the YouTube trailer is up. The Shell Game Trilogy: it's been a long time coming. I'm been sitting on these tunes, some of them for over a year, and I can't wait to start sharing the music with you starting on July 7. 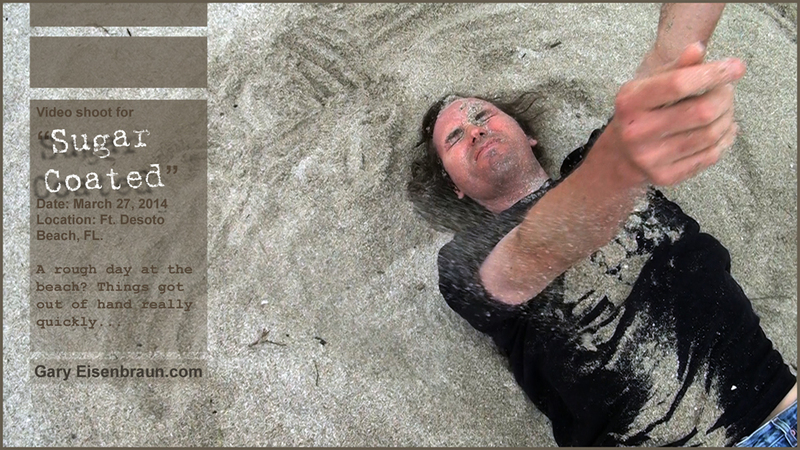 Even before then, the first music video, "Sugarcoated" is FINISHED and is mere weeks away from release. There are only SEVEN more videos to follow. Right now, however, you can get a sneak peek on YouTube because we uploaded the series trailer. Enjoy. FACEBOOK (05/25/14): Alrighty. We just posted a trailer for the upcoming Shell Game releases. Tonight we start working on the "Sugar Coated" video. Yes! It's getting closer. Check out the trailer at: http://youtu.be/KA4EA6cC7YQ. 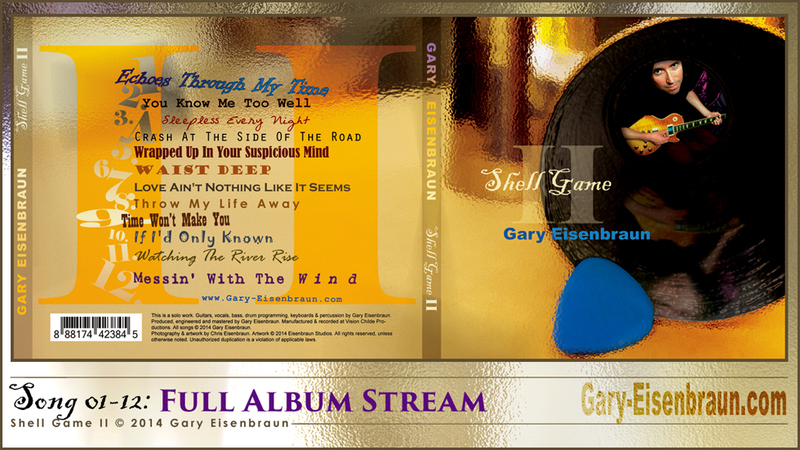 FACEBOOK (05/17/14): At absolutely the very last minute, I added one more track, "Soothe You For A Little While", onto the new CD "Shell Game I". I was actually mixing the song up until the very hour that I submitted the finished work. Things were crazy and it was super hectic but we pulled it off and there are now eleven tracks on the album. This is a song that I wrote many years ago, had completely forgotten about, then found it by accident on an old CD, liked it so much that I re-recorded it. It's crazy how something sounds so wrong to you at one time and so right at another. We have also been working on some more footage for the music video for the first single, "Sugarcoated." In the footage, I was sitting in front of a LARGE plate of sugar... and it started raining but we persevered and shot around the rain drops. BTW: dig my five day growth of beard. Anyway... when you hear this song... it's rocking...not saccharine. CD BABY (05/04/14):Album description uploaded. A nasty blues riff leads into the opening line, "I don't even know my name." ...and the Shell Game is on. Just like in the classic shell game, three cups (or albums) are set in motion and the trick is to discover where the treasure lies hidden (the fourth album). Four albums, three release dates. 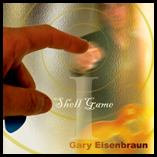 This is Gary Eisenbraun's (rocking) Shell Game Series. Featured songs: the riff heavy "Sugarcoated", the punk-like "Shadow" and the epic blues of "Across a Crowded Room". 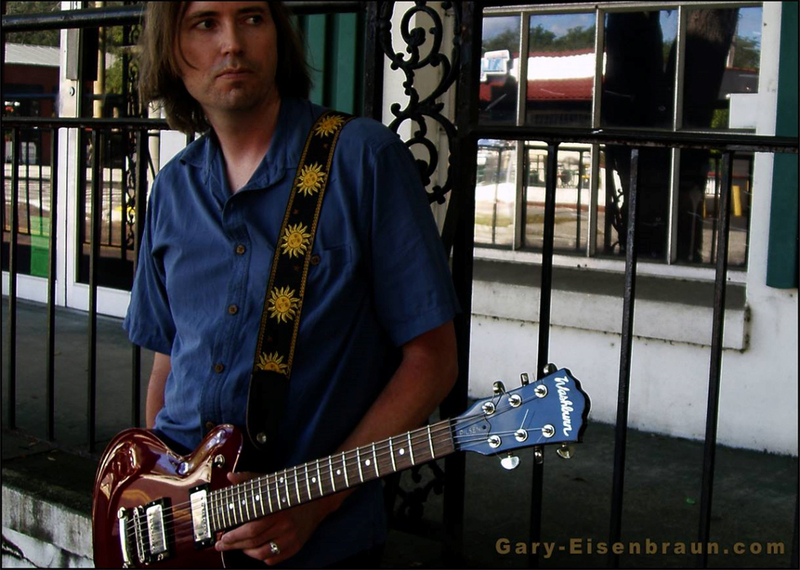 Whether it's a nasty Les Paul strung low or a more ethereal take on blues rock, Gary's sound is his own and it's here in spades, all through these four albums. The real sleight of hand going on here is that the fourth album is a rock guitar instrumental album hidden within one of the three releases. Artist note: this isn't a "concept album" or a "rock opera". The Shell Game is the common thread that links these four albums together within the three release dates. FACEBOOK (04/28/14): Hello, been hard at work creating the final mixes for my next humongous project, ...this is actually the BIGGEST project that I have ever been associated with. I can now say, it is called "Shell Game". Here's what is really crazy, it's really three different releases, all coming out seven weeks apart from each other. This is a series of albums and each has to stand up on its own as well as be part of the series. And, as a consequence, for the last bunch of weeks I have been mixing and re-mixing this collection. Sometimes it has been humbling trying to find the answer to different audio problems, but in the end all I will remember is how proud I am of these batch of songs. It's taken a little longer than expected to finish, but it will be worth the wait. I've enclosed a photo still from the video of "Across a Crowded Room" which is a kind of epic blues song that gives me chills when I here it (and that almost never happens). GARY'S NOTES (03/29/14): Once we decided to go with the Shell Game concept, we needed a joker from amongst the instrumental songs and so "The Joker" was born. FACEBOOK (03/27/14): Rough day at the beach? Today we were actually shooting footage for my next music video. It's a rocking tune called "Sugar Coated" from my soon-to-be-talked-about upcoming project. Although my picture shows telltale signs of a Tequila based experience, no alcohol was consumed until after we finished filming (and I got all of the sand out of my mouth). I had sand in places it has never been before! In fact, I'm still finding more of it, hours later. The most important thing is I had fun. There's a lot of cool stuff... but I can't share it YET. 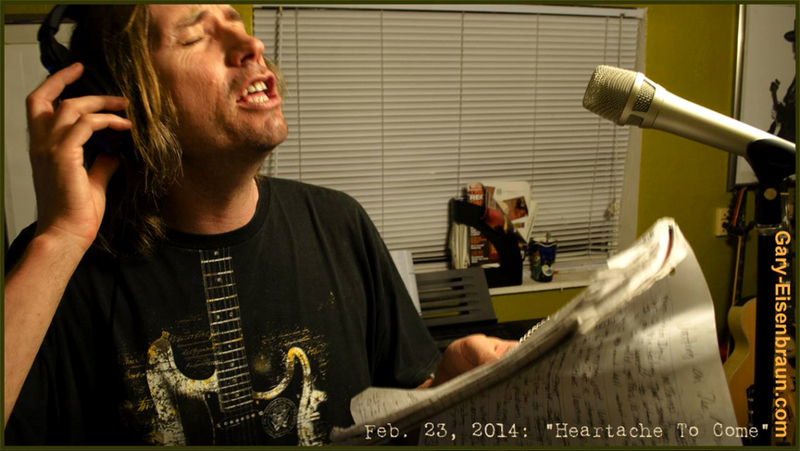 FACEBOOK (02/23/14): I was working on a song this weekend called "Heartache To Come", which is an opening track. I was happy with the version that I recorded months ago, ...but it was quietly pulling at me that I hadn't gotten the most out of the song. Somehow, the song had lost it's soul in a mass of guitars. I would re-record different parts of the song, still happy but not completely satisfied. Finally, I decided to break it all apart this weekend. With significant meditation and deep thought, and a little bit of luck ...bingo. Yeah! That is what it's all about. As a musician, I have sooo many things I want to get ...out, and when that REALLY happens... it is very gratifying. FACEBOOK (12/02/13): O.K., we shot core footage for 2 more music videos to bring our grand total up to EIGHT. This is going to make the next year... quite interesting. In the next 12 months, 9 music videos and 6 separate CD releases (3 back catalog and 3 brand new), ...so I'm hoping at the end of THAT, that you are not sick of me. The first release comes a week from tomorrow (Dec. 10). At that time, we will be posting a brand new music video, "Disconnection Of Your Love" on my YouTube channel. 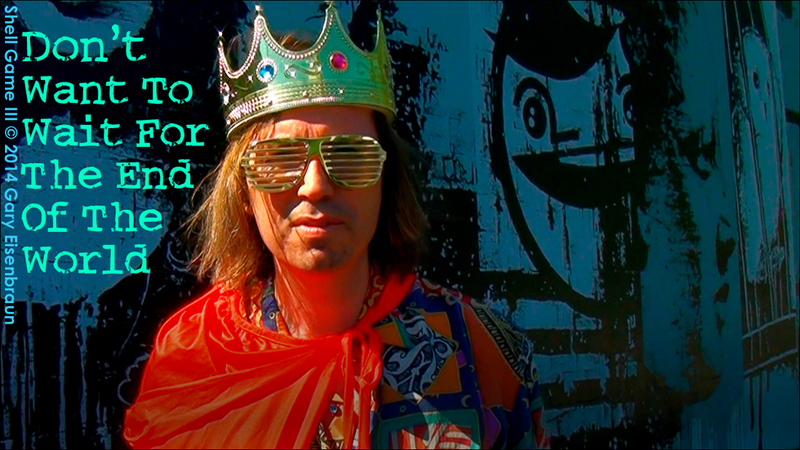 BTW Chris re-colorized "Breaking Your Illusion" (our very FIRST music video we ever did). Both will go up when the album is released. Between these two videos... you can see how FAR we've come. Anyway. Confused yet? I'll leave it at that for now. Note from Gary: this post isn't JUST about the Shell Games but does include them ...and gives a real snapshot of the total moment. FACEBOOK (11/26/13): 3 days, 6 music videos. 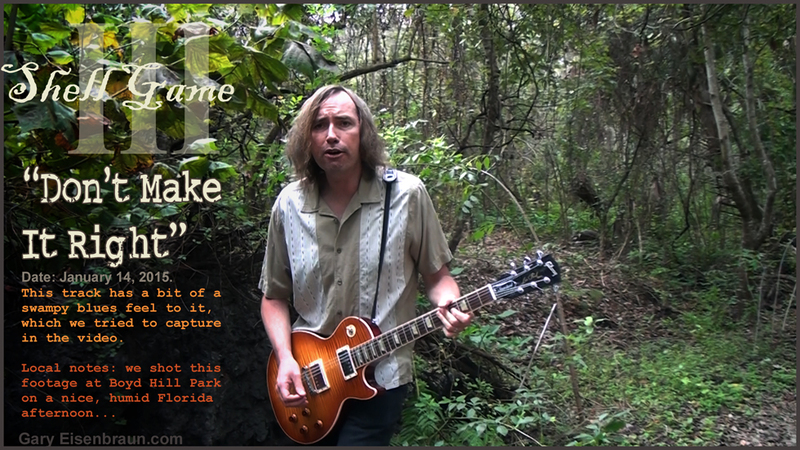 It's so swampy down here, in Florida, that THIS is the time of year when we try to get footage together for music videos for any upcoming releases. I have a ton of music coming out in the next year (more details later), with videos to match. We got some great stuff the last few days, some in urban areas and some out in the wild. We still have some more work to do on a few more, but it's all a blur right now. Anyway. Here's a shot from one of the videos that we shot today, for the song, "Don't Make It Right." AND... Happy Thanksgiving..
FACEBOOK (10/22/13): Yeah! 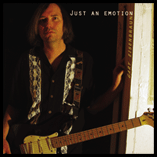 I COMPLETED my new collection of guitar instrumental songs. Of the FOUR guitar instrumental cds that I've done so far, I think that this cd is CLEARLY better than the other ones. My playing, even as long as I've been doing this..., I'm still getting better. It took me a little while, during the process, to get my playing to the point where I was happy with it. Few things in this world bring me as much joy as playing guitar... especially when your creativity is playing with you. The final addition was a pretty song called "Infinite Sunshine." However, I think that "Secret Pact" was my favorite song of the bunch. I'm sorry but I really can't explain why I like this song so much. It's going to be a while before this sees the light of day... but, some stuff is about to come out. Stay tuned and I will clue you in..
FACEBOOK (09/27/13): Hello all, it's a time of transition right now. With all of the music that will be released next year, I also preparing an album of guitar instrumentals that will be a part of it. I had put together a bunch of songs for this months ago but I was not happy with it. The reason why, took me a while to figure out. It turns out that my playing was (too) sloppy. With all the things I do in music production, the one thing I never worry about is my guitar playing because it comes so naturally to me. 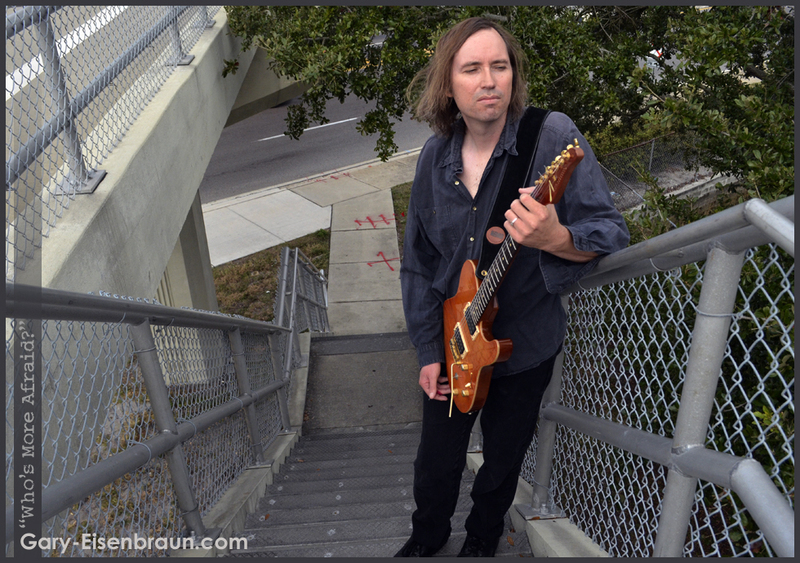 Generally when I record, playing lead guitar I don't spend much time on thinking about it. It is something that I have been doing my whole life. Songs with vocals... the guitar is there more for a feel. BUT, instrumental music requires something much closer to perfection. Hopefully...without losing the soul of the piece. Anyway. I am committed to upping my practice routine so I can really ATTACK and get the BEST out of myself. It just goes to show that you can't take anything for granted. FACEBOOK (09/13/13): Well..., I just finished completely re-recording what I believe is the final song for my next project. This is a song that has been sitting around since early 2006. I never could find the right place for it, even though I always liked it ...but it is a perfect fit for what I want to do with this release. This song has the distinction of being the lengthiest song I have EVER recorded (9 minutes). It has quite a bit of dynamics in it and I was having SO much fun... that the entire song took less than a day to complete. A piece this long could easily get grandiose, but anything done THAT quickly rarely has time to develop a big head. The song is called, "Broken Mirror." I have literally hundreds of songs that have never been released. I think that they have a quality to them and they're there for me if I need a lifeline. But, for now... I have a LOT of material and am about to put THIS writing cycle to bed. 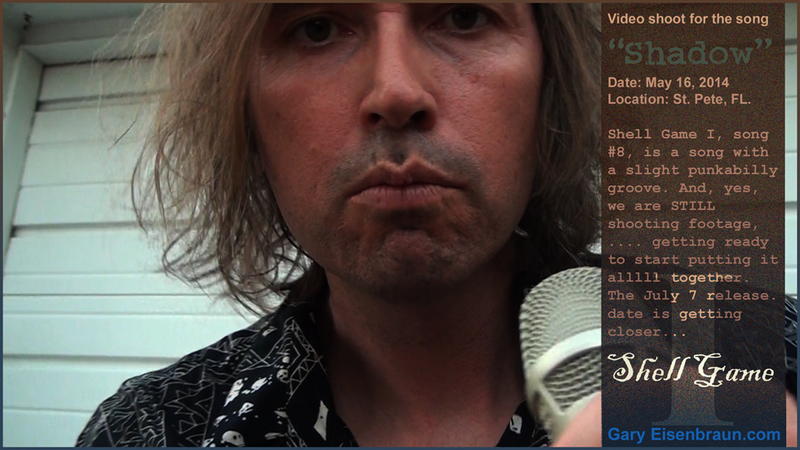 GARY'S NOTES (09/08/13):The last song from a Labor Day holiday writing period, "Shadow". I KNEW this was the last song because I only one day left to write. During a hot streak, I always want to see if there is one more in me and this was it. In my head I heard a Yardbirds kind of sound but that isn't exactly how it turned out. A lot of times you think of your influences and hopefully, if you have your own identity... it won't come out anything like those influences... it will come out as you. I was going for an old time rock song with a 60s surf vibe and a punk edge to it. FACEBOOK (09/05/13): Ah! Got just what I needed. The recent injury has healed to the point where I'm back to normal. The cool thing is, a little time off of my guitar let me see this next batch of songs with more objectivity. I felt that a bit more melody and lighter approach would add a new texture, something that was needed (my songs were getting just a little bit heavier than I liked). I Wrote 7 new songs in 5 days including the song that will be the opener for my next release. "Heartache To Come" is the song's name and I'm very excited about it. In the upcoming weeks, I will start to reveal more details about a succession of new releases early next year. Here's a picture from day 5 ...with 4 days of beard growth. Ha ha. GARY'S NOTES (09/03/13):"Messed Up On My Chances With You." The line, "reality becoming the role" was a phrase that I heard Lindsay Buckingham say in an interview when talking about his relationship to Stevie Nicks. The line and the idea behind it just got stuck in my head. What I like about this song: the laid back funky groove and the dynamics of the push and pull. This was the first or the second song of the labor day eight. 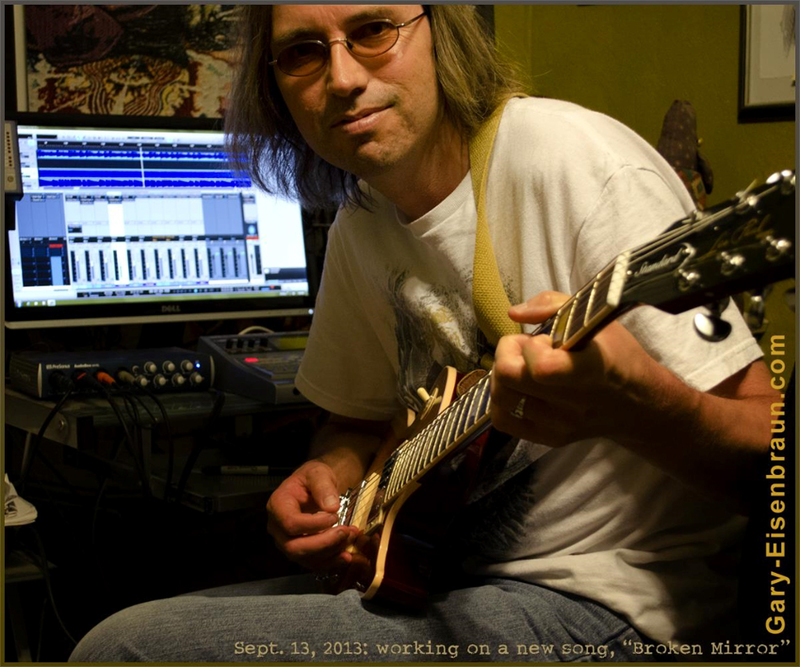 The initial riff of the song: I was looking to play something completely uncomfortable to me. It sounds simple but it was an uncomfortable riff to play. FACEBOOK (07/10/13): Hello, it's time for an update on new music. The 25 songs that I HAD... have grown to 34. Usually when you have this many songs... some of them... you are not particularly attached to and they tend to fall by the wayside. BUT NOT THIS TIME. As of this 34 however... I am CUT OFF. Ok. The amount of new music... is presenting a problem... regarding releasing it. We have a few ideas that we are tossing around... and they're a little different. That's all I'm going to say about it...for now Ok? I have a LOT of work to go yet...putting all this new music together, etc. Keeping tabs with all of these songs is extremely challenging and tends to dominate my thought processes. BTW. Hope you had a GREAT July 4th holiday. 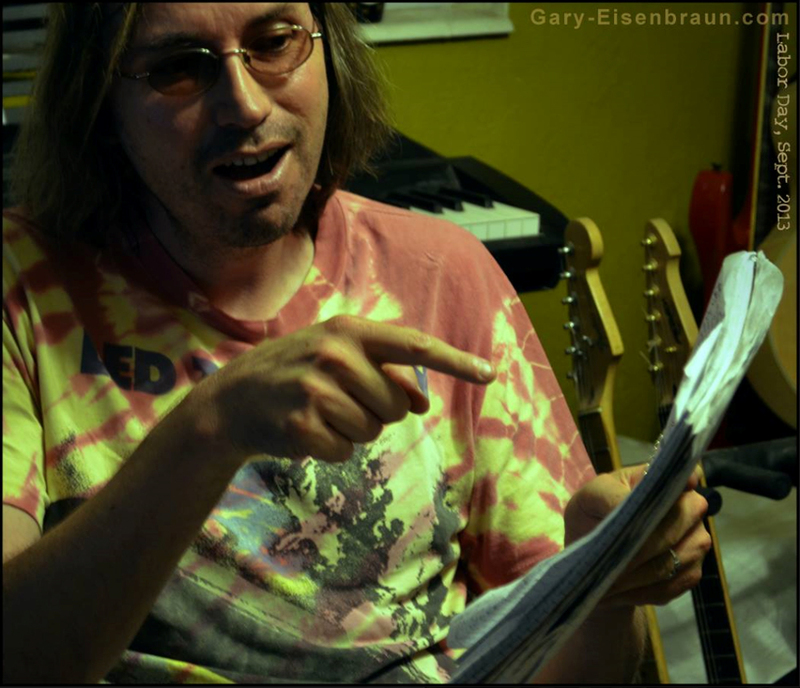 GARY'S NOTES (06/18/13): This song, "Rise And Fall", was the BEST of four or five songs written this week. Pretty happening groove and the chorus sticks in my head. 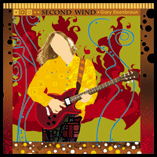 GARY'S NOTES (05/26/13): I was sitting on a big round chair, one Sunday morning playing my twelve string guitar and some really cool chord voicings were coming to me. All of the parts for "Sleepless Every Night" came within half an hour of each other. I could not record it fast enough. The lyrics were really quick too. Any song that writes itself that fast, is always good. It's a fact. The ones you labor with... sometimes are ok.
FACEBOOK (05/20/13): Very cool weekend. I was pretty set on a bunch of songs for the next album but low and behold, a new one came out of nowhere that I think could be the best song I've ever written. The song is called "Who's More Afraid" and I'm very excited about it. I am constantly writing songs because you never know what might come out at any time. Usually when there's one good one, others are right behind so I'm anxious to see what's next. It'll make for harder decisions when picking songs for the album...but so be it. Here's a photo for the song, "Who's More Afraid." The pict came much later... but I thought it would be cool to share it at the MOMENT the actual song came into being. FACEBOOK (05/10/13): Hello, it's been a while since I posted. But, the last few weeks have seen much work on my next album. I am trying to step up my game on this one(not that I'm dissatisfied with my last ones). I'm just trying to reach deeper inside. I find myself dissecting stuff a lot more (hopefully without OVER-dissecting it). There are currently 17 new songs vying for my attention, including 3 or 4 songs over 7 minutes long. This is really the most fun part taking all of these pieces and fitting them into a puzzle. Even as I'm working on this, I am also remixing older albums to put up in new digital form. This is also an arduous task with lots of technical issues that you probably don't want to hear about. Anyway. A few posts ago... the guitar that I put the new pickups in (the Tom Anderson)... is REALLY working GREAT. And I am so happy with it. Bye for now. FACEBOOK (03/14/13): Well I've returned to working on my next album. To refresh your memory, this is the one where I'm trying to pull something from really deep down inside myself. Not suprisingly, it isn't easy, but it's about halfway done. I'm being very demanding of myself, which makes it extra complicated to let things flow. The arrangements are more expansive with a few songs over seven minutes long. I'm putting more pressure on myself which isn't as joyful as normal, but it sounds real good. Also the next music video for "Where Do You Draw The Line" is on the way. 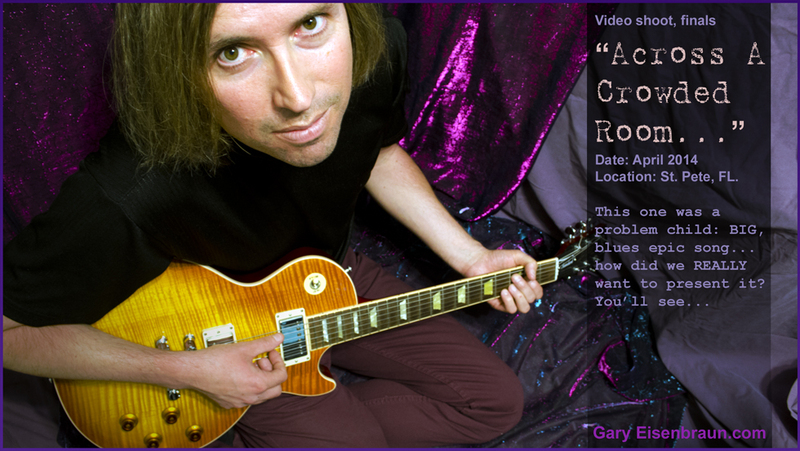 GARY'S NOTES (02/08/13): This was a very personal song of loss, "I Can't Love You No More". Completed in one day. 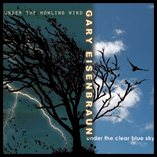 GARY'S NOTES (01/21/13):"Sugarcoated," "Tears On The Water," "Lost Your Broken Wing," "Echoes Through My Time," "Waist Deep," "Love Ain't Nothing Like It Seems," "Time Won't Make You," "Dirt On My Hands," "Broken By the Fall," "Lost Inside A Dream" ...and even more (that didn't make the cut). All of these songs came from one writing period, Christmas 2012. I think of this as one of the hottest writing streaks of my life. Now that I've finished lyrics to these songs, their true potential is taking shape. One real highlight, the guitar solo to "Sugarcoated", which was the second take...came quite naturally. As a guitarist, if your tone is happening... it makes the music come much easier. 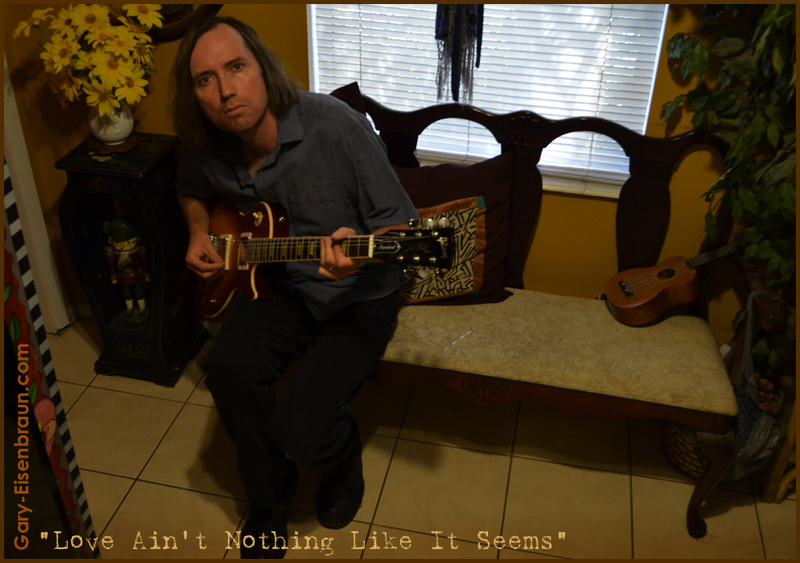 BTW, here's a photo for the song "Love Ain't Nothing Like It Seems." Although we took the pict much later, I thought it would be cool to share it here with you. FACEBOOK (01/04/13): Happy New Year! Every year, at the holidays, I use the solitude as an opportunity to create new music. This year, I felt like pushing myself (harder than ever before). Everybody has a sound in their head that remains there... unsatisfied. I took a hard look at what I REALLY wanted to produce (musically)...and... I believe that this time, I've gotten closer than ever. I NOW have TWELVE really promising musical ideas to work on (over the next several months). These are the kind of songs that I have been chasing after... for a very long time. My biggest inspiration has ALWAYS been Jimmy Page. I studied his work much DEEPER than ever (recently), knowing that I have so many other influences that this music being created will not be just a copy of Jimmy Page...but MINE. Granted... I have a long way to go, a long journey to bring these songs to fruition but I'm very excited at this beginning. But just to keep the confusion DOWN... these songs that I am talking about have nothing to do with the album coming out in February (which I am also very proud of). Anyway. Once again, "Happy New Year! ".